Operation: M.Y.O.W. Classic Slot Guide & Review - Casino Answers! Operation: M.Y.O.W. is a 3-reel, 1-line classic slot machine developed by Realtime Gaming. 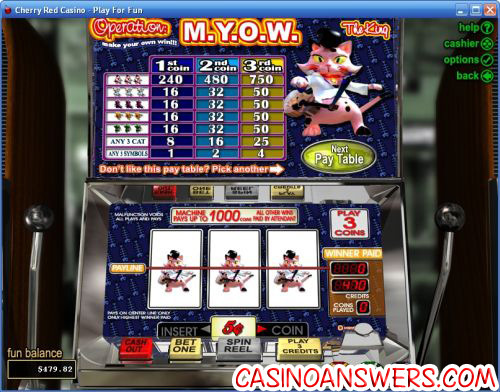 The “M.Y.O.W.” stands for “Make Your Own Win,” which is the main feature of the Operation MYOW slot machine. 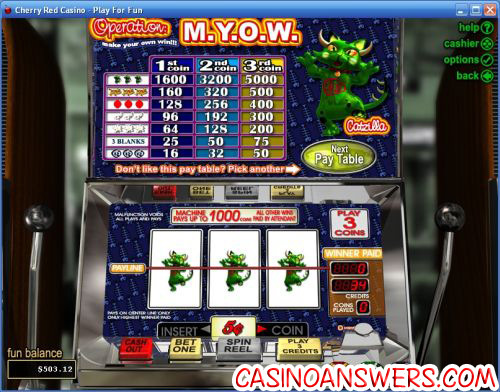 You can play the Operation MYOW slot machine at US-friendly online casinos Cherry Red Casino and Aladdin’s Gold Casino. To play the Operation MYOW slot machine, first you can change the coin value of the game from the minimum of $0.05 to $0.25, $0.50, $1 or $5. When you have chosen your coin value, you can then buy some credits by clicking the $5, $25 and $100 chips. You can buy as many as you like and can cashout at any time by using the red “Cash Out” button at the very left of the game buttons. If you must do this in this order, due to the fact that your credits will be cashed out and returned to you when you change coin values. The next step is the fun part – playing the game! You can either make the maximum 3-coin bet by using the “Play 3 Credits” button or you can hit “Bet One” once or twice followed by the “Spin Reel” button. We recommend playing all three credits – not only is it easier, but there is more value in playing three credits rather than one or two. The smallest bet you can make on the Operation MYOW classic slot machine is $0.05 (playing a one coin bet on the $0.05 default coin value). The highest bet you can make on the slot machine is $15 per spin (maximum 3-coin bet on the $5 coin value). The top jackpot on the Operation MYOW classic slot is the Catzilla symbol on the Catzilla paytable. Three Catzilla symbols on a 3-coin maximum bet will win you 5000 coins. The second highest jackpot is the Lucky Cat symbol on the Lucky Cat paytable for 1500 coins. This is the default paytable that you will start out with. There are five different paytables on Operation MYOW: Lucky Cat, Bat Cat, Kung Fu Kitty, Catzilla and The King. All of the paytables have the same symbols, but they will payout differently depending on which paytable you are using. There are advantages to each paytable (the ones with the lower payouts will be easier to get small wins on). That is what makes Operation MYOW a very versatile slot machine, customizable for casual slots players and high rollers alike. Payouts on Operation MYOW’s Lucky Cat paytable are (1/2/3 coin payouts in parenthesis): 1 Lucky Cat symbol (2/4/6), 3 Blanks (3/6/10), any 3 Cat symbols (5/10/25), 2 Lucky Cat symbols (32/64/100), 3 Rising Sun symbols (32/64/100), 3 Dragon symbols (80/160/250) and 3 Lucky Cat symbols (400/800/1500). The Lucky Cat paytable has the second highest payouts of all of the paytables. It has added value on almost all of the 3-coin payouts. Payouts on the Kung Fu Kitty paytable are: 2 Asian symbols (1/2/5), 2 Flower symbols (3/6/10), 3 Asian symbols (3/6/10), 3 Flower symbols (8/16/25), 2 Fish symbols (16/32/100), 3 Fish symbols (32/64/100) and 3 Kung Fu Kitty symbols (320/640/1000). The Kung Fu Kitty paytable offers some, but not much value on the maximum bet. It is the third largest (or middle) paytable. Payouts on Operation MYOW’s Bat Cat paytable are: any 2 Cat symbols (1/2/4), any 3 symbols (1/2/4), 3 Blanks, (1/2/4), any 3 Cat symbols (2/4/5), 1 Bat Cat symbol (2/4/6), 2 Bat Cat symbols (6/12/18) and 3 Bat Cat symbols (16/32/50). Bat Cat has the lowest payouts of all of the paytables but the easiest wins, due to the fact that all you need to do is hit 3 symbols and you will win 4 credits. The Bat Cat paytable if you’re not concerned about getting a big win and having some fun, while not losing too much in the process. Payouts on the Catzilla paytable are: 3 Asian symbols (16/32/50), 3 Blanks (25/50/75), 3 Flower symbols (65/128/200), 3 Fish symbols (96/192/300), 3 Rising Sun symbols (128/256/400), 3 Dragon symbols (160/320/500) and 3 Catzilla symbols (1600/3200/5000). This is the paytable for high rollers. You need three symbols (or blanks) to score any wins on the Catzilla paytable, but if you get it, it will pay off. The lowest payout is the same as the highest payout on the Bat Cat paytable. There is, of course, a lot of value for making the maximum bet on the Catzilla paytable. Operation M.Y.O.W. is a very customizable slot machine and is great for all types of online casino players. We haven’t even mentioned the fact that the dressed up cats are very cute. Cat owners will have fun playing all of the different paytables on Operation MYOW just for that. If you’re going to play the Operation MYOW slot machine, you might as well get yourself a purr-fect bonus while you’re at it! Sign up and make your first deposit today at Cherry Red Casino to receive a 100% up to $7,777 signup bonus, which might just be better than catnip! Can players from the United States play the Operation MYOW slot game for real money? Much like the different paytables on Operation MYOW, USA casino players can choose between the 100% up to $7,777 welcome bonus at Cherry Red Casino or the 200% unlimited signup bonus over at Aladdin’s Gold Casino. Of course, there are several other online casinos to choose from. If you want to have a look at some more RTG casinos, please read our list of RTG Online Casinos article. What is the top jackpot on the Operation MYOW classic slot machine? Overall, the top jackpot is 5000 coins on the Catzilla paytable. On the other paytables, it is 1500 for Lucky Cat, 50 for Bat Cat, 1000 for Kung Fu Kitty and 750 for The King. Each paytable’s top jackpot is three symbols of the cat that it is featuring on the center payline.